Your plants’ roots are the key to your yield size and potency, that’s what the research shows. Yet the first thing you notice about most hydroponics roots zones is they are biologically sterile. Nothing other than roots is alive in them. When you focus on your roots, you might notice that they’re bare and spindly-looking. But healthy roots actually look healthy, not like most roots you’ll see. They’re “muscular,” intensely-branched, thickened, and robustly alive. You don’t see that kind of roots very often in hydroponics gardens unless you’ve imported beneficial microbes into your root zone. One other thing… for beneficial microbes products to be successful for you, they have to have a very high number of colony-forming units per gram. In simpler language, this means that the formula should have a high number of microbes per gram. Tarantula clocks in at just under 10 million viable bacteria per gram, making it by far the strongest of its type. It’s confusing and frustrating when you go to a hydroponics store and see beneficial microbes formulas made by different manufacturers. Your obvious question is which of these is going to give me the biggest bang for my buck. One thing to remember is there are two very distinct processes manufacturers can choose from when they want to offer you beneficial microbes products. The most common process happens when a hydroponics company calculates that it can save on production costs by hiring a third-party company to bulk produce/bulk combine microbes without testing them for specific plant appropriateness or microbial compatibility. And in the process they forfeit supervision of manufacturing and quality control. Not only that, but their process includes an overly generic view of microbes. For example, when someone talks about the microbe “Bacillus subtilis,” that strain name is really just the tip of the iceberg… it’s exactly like saying “General Motors” to describe a car, but you have no idea if it’s a Pontiac or a Chevy. And if it’s a Chevy, it could be either a Malibu or Corvette. So if you’re lucky, you got the Corvette – but you’re still left guessing if your Corvette has the 300 hp motor or if it’s a ZR1 Corvette with the 620 horsepower motor! Obviously we absolutely make sure Tarantula microbes are always the ZR1 Corvette with 620 horsepower motor, not the Chevy Malibu! Advanced Nutrients hires the sharpest microbiologists in the world. One of them is especially impressive: she has THREE Ph.D. degrees! We have a team of scientists testing and breeding hundreds of sub-varieties of Bacillus subtilis and other beneficial microbes in a continual research program and we are always upgrading our formulas. 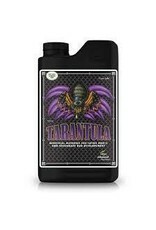 Tarantula is NOT outsourced. We’re the only hydroponics nutrient company in the world manufacturing all our microbial products ourselves with a full-time Ph.D. microbiologist personally supervising all aspects of production at all times. (The same is true for our Piranha and Voodoo Juice products). Each microbe strain is individually bred (not in a bunch of vats or tubs) in a purpose-built 10,000 liter breeding reactor. This is a very critical, time consuming step, but it’s necessary because different strains of beneficial microbes breed at different rates and we have to ensure total uniformity and maximum colony forming units (CFU’s). 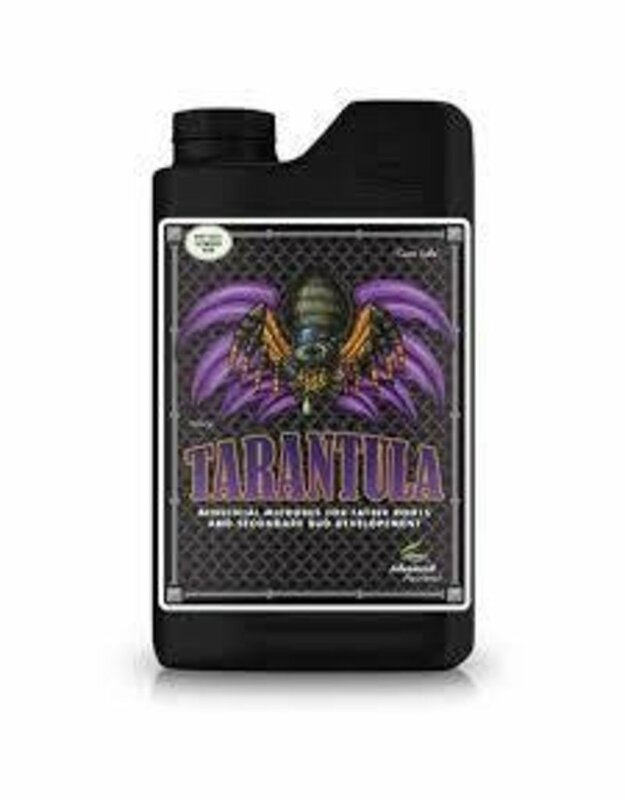 After breeding, the microbes are taken to the evaporation tower and dried, and then all the strains in Tarantula are carefully recombined. 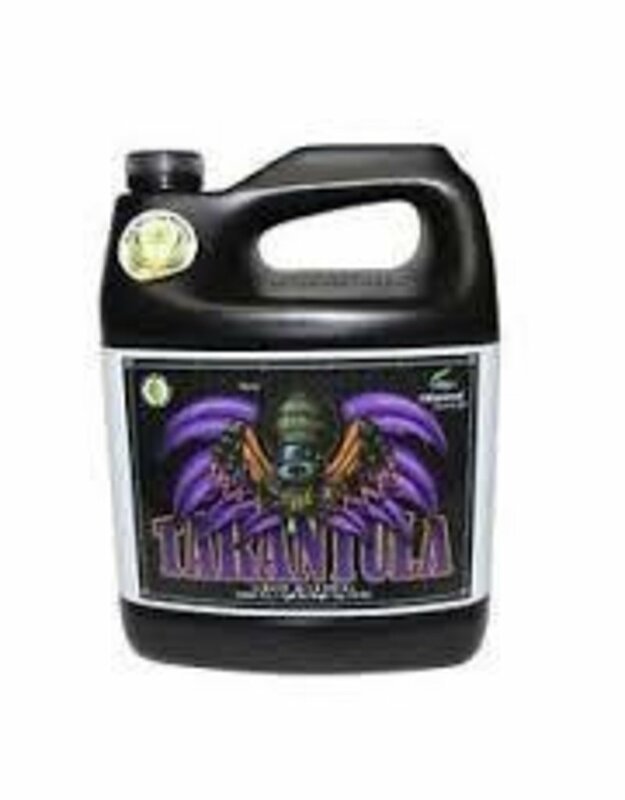 To ensure Tarantula’s very long shelf life and superior viability, its microbes are put into hibernation with an “antagonist” compound that keeps the microbes dormant until you mix Tarantula into a nutrient reservoir and the antagonist is diluted. As soon as the antagonist is diluted, Tarantula’s microbes immediately exit dormancy, replicate quickly, and burst into action for you by wrapping themselves around and penetrating into roots, promoting the production of flower-boosting hormones by your plants, and maximizing root size and function. When you pick up Tarantula today, you’re on your way to making your garden the maximum-yielding envy of all your friends. 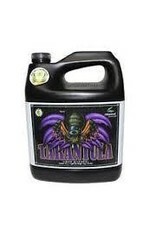 Get your roots enhanced using Tarantula, and watch the guaranteed optimum bud results.